The first issue of Damian: Son Of Batman was very interesting as a modern DC comic book. Unlike 80% of the line, it blew through an immense amount of plot in only a few pages. This makes sense as Andy Kubert is seemingly given free reign to do whatever he wants in this mini-series. The creator is tackling both the pencils and art in the story. It is written in a very unconventional manner that is similar to Batman: Odyssey by Neil Adams in several ways. Both feature craziness and some truly bizarre art, in only a way that longtime comics veterans can provide. As the first issue proved, Kubert may not be the best writer on the face of the planet. Despite that, this is not a bad yarn. It features what could be the beginning of the Dark Knight originally seeded in Batman #666. 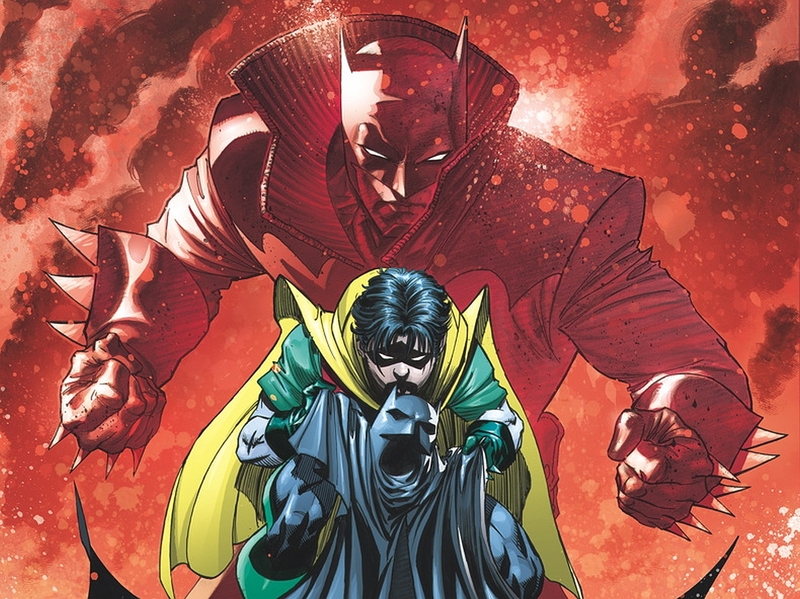 The first issue featured both the death and return of Bruce Wayne with Damian taking over as the masked vigilante known as Batman. The character naturally regresses as soon as he is given the mantel, because of the ark that the amateur hero has endured this notion seems logical. This chapter houses the supposed death of a mentor that has been integral to the series thus far. Kubert’s writing is anything but subtle here, sometimes it feels like the writer is beating each and every reader over the head with twists and turns aplenty. If he did not telegraph what was happening next, this would have been a more interesting series all around. The inclusion of a certain villain in this issue, is a great twist of events, and gives much love to the source material that the book is indirectly based on. Grant Morrison would be proud. The problem with the book at large, is it seems like this installment should have ended ten pages prior. The sense of pacing is really off here, which is ironic because there is an immense amount of plot being burned through here. The last couple of scenes are just for fun, and meander into some interesting territory, but leave the cliffhanger of the book feeling really dry. There are several mysteries here, and reasons to read this series, but it is unquestionably silly. Art here is sort of hit or miss. A double page spread seen in the beginning has some truly wonderful depictions of the title characters. Similar to other works by the artist, some pages are much more consistent than others. This is a matter of taste, but I personally do not prefer the art of Adam Kubert. He has the proper amount of technical skill that is necessary for someone working in the medium, but this type of pencilling is not currently in style. After looking at a few innovative creators, the work seems sort of pedestrian. There are flashes of brilliance here, Mostly hinging on ultra detailed pages, but they are still far and few between. Storytelling is also not bad, the work is fluid and consistent for the most part. Damian: Son Of Batman is not the greatest comic book on the face of the planet, especially when there are some other truly groundbreaking works in the medium hitting store shelves this wednesday. Kubert is doing a solid job on the series, but not breaking any new ground.